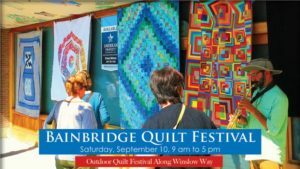 On Saturday, September 10, the Bainbridge Island Modern Quilt Guild will again sponsor their popular one-day-only Quilt Festival — their Fourth Annual! From 10 am to 5 pm over 100 quilt entries will line the sidewalks of downtown Winslow — and if you’re a quilter, it’s not too late to enter! As you stroll along Winslow Way, admiring this year’s quilts, special quilt ambassadors in bright green aprons will be available to watch over the quilts and answer your questions. And then, if you’re feeling inspired, you can head over to the Bainbridge Island Museum of Art, where there will be a hands-on quilt sew-in. Anyone who’s interested can go up to the 2nd floor work room, sit down at a sewing machine, choose some fabric, and be guided to make a contribution to our next Wounded Hero quilt, which will be donated to a veterans’ shelter in Kitsap County. And you can do more than look: Many of the quilts can be purchased — or you can purchase one or more raffle tickets for a chance to win a beautiful 57: x 66″ quilt, “Star Struck,” made by the Bainbridge Island Modern Quilt Guilders. Raffle tickets may be purchased at the information booth on Madrone Lane, at Esther’s Fabrics on Winslow Way and during the Bainbridge Art Walk on September 2nd. 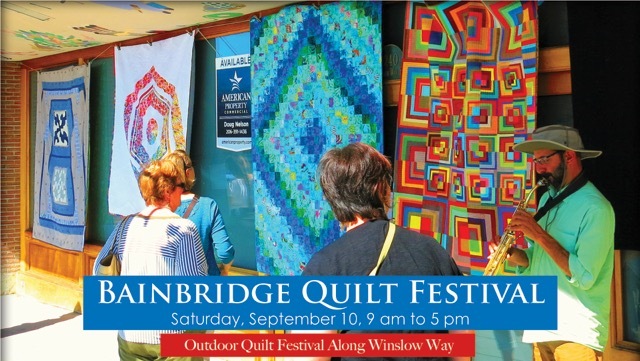 For more information about the Guild, the Festival and for entry forms, go to BainbridgeQuiltFestival.com. Credits: BCB host: Channie Peters; BCB audio editor and social media publisher: Diane Walker.